This collection is comprised of four instruments, the Flute, the Alto Flute, the Bass Flute and the Piccolo. Tired of Giga-sized pre-recorded libraries of flutes and of the objective limitations of traditional samplers? SWAM Flutes is the solution. 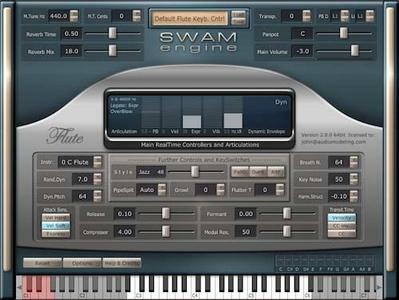 Developed by Audio Modeling using the SWAM Technology (Synchronous Waves Acoustic Modeling) through a combination of innovative performance techniques and concepts of physical and behavioral modeling with the multi-vector/phase-synchronous sampling technique, the SWAM Flutes bundle includes four instruments: Flute, Alto Flute, Bass Flute and Piccolo. Real-time controllable via MIDI controller, SWAM Flutes requires only the smallest footprint to create the perfect organic consistency resulting from the endless expressive parameters that are unique of every live performance: it's the set of most expressive and realistic virtual flutes on the market. SWAM Flutes, like all SWAM Engine digitally handcrafted acoustic instruments, is not a simple recording of notes via sample libraries, but a set of real virtual instruments based on their traditional counterparts. Our technology allows you to fully control the expression of any virtual acoustic instrument: you will stop listening, and you will start playing for real. Audio Modelling SWAM Engine - SWAM Viola v2.0.1 WiN | 5 Mb SWAM Viola is the most realistic, real-time controllable, expressive virtual viola on the market. Audio Modelling SWAM Engine - SWAM Double Bass v2.0.1 WiN | 5 Mb SWAM Double Bass is the most realistic and expressive virtual double bass on the market.